'Tis cold outside | My mother always said 'classy girls never look cold'. Now that autumn is here I am busily preparing for the proper cold. Last year my mum decided I should learn to knit. Having left my sewing machine at home, she thought that I could give my creative side an outlet without needing large machines by using only two needles and a ball of wool. I’ve never been a knitter. I tried to knit a scarf as a child which ended up looking more like a sock. I couldn’t get the tension right. So when mum sent me a ‘knitting for beginners’ book I thought she was barking up the wrong tree. After a few months of cold nights inside, however, my fingers were itching for something to do, so I took myself to the local knitting shop – Loop – in Camden Passage. Loop is a knitter’s paradise. Housed over three levels (the top floor being their storeroom), wool cascades from cubby holes, and inspirational projects hang from under the stairs and drape themselves over you as you climb up to the second floor. I asked the lovely ladies there for some help picking needles and wool that wouldn’t get me into too much of a muddle. 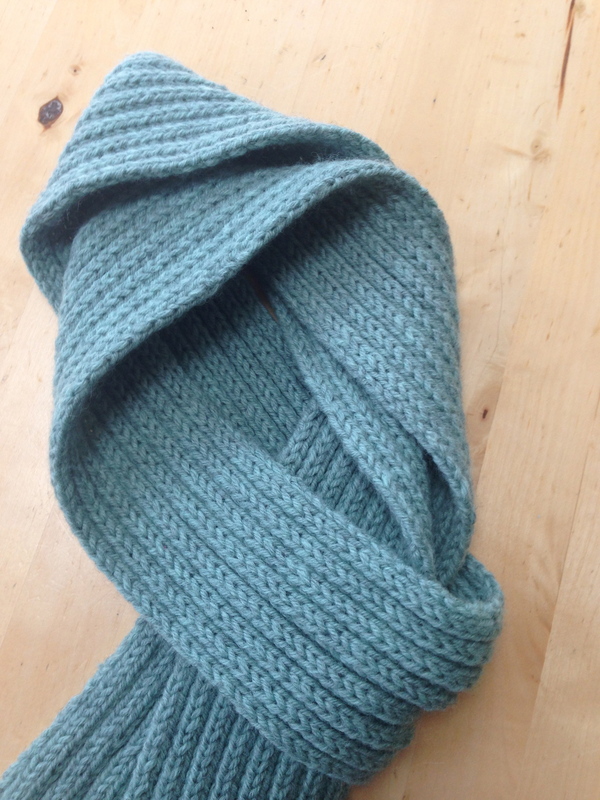 I started simply: a scarf in thick, pale green wool, great for beginners. Teaching myself first to knit, then to purl, then to knit two, purl two, the scarf progressed quickly, foot by foot, until I ran out of wool. Darn. Back down to the wool shop for another few balls. Another few feet and I was done. Straight lines: mastered. The next project was a baby blanket for whomever in my friends or family has the next baby, in a luxurious motley green wool, knit two together for warmth. The project progressed remarkably quickly for its size. 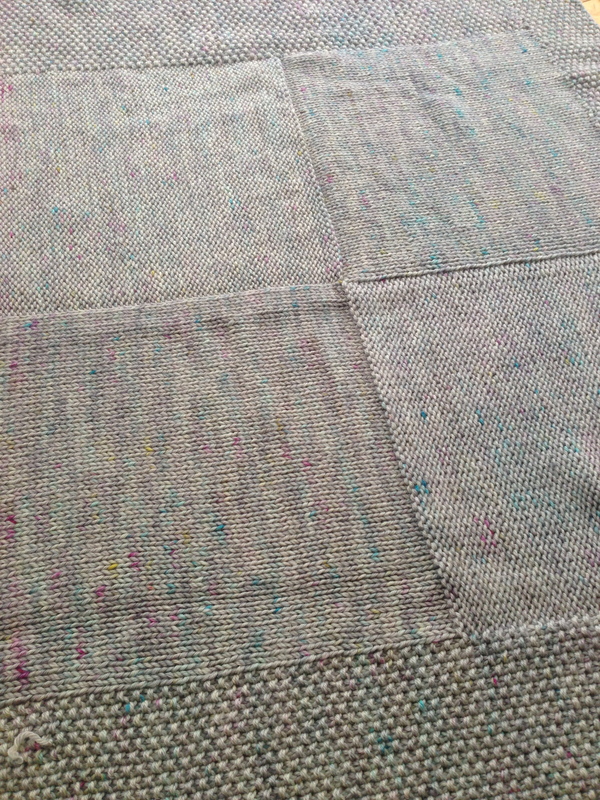 With straight lines again the limit of my technique, I learned to seed stitch to create the lovely, bumpy edge pattern. Tony had been watching all this industry happening on the couch next to him and decided he wanted to benefit, too. Off to Loop and we picked out wool for a scarf for him (accidentally in West Ham colours). 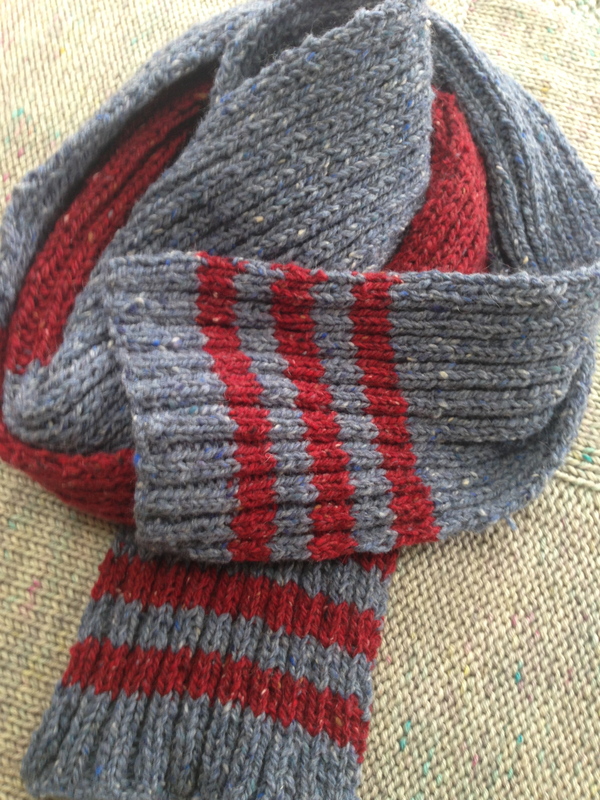 I got through the first half foot before summer arrived, but then it was too hot to be working with wool and the scarf sat neglected in a bag until two weeks ago. In a flurry of industry I worked on it in the crowed train on the way to Gloucestershire and in the kitchen of our friend’s farmhouse. By Sunday morning it was as tall as Tony (apparently the way you measure the right length for a scarf) and cast off. Time for another project for me! 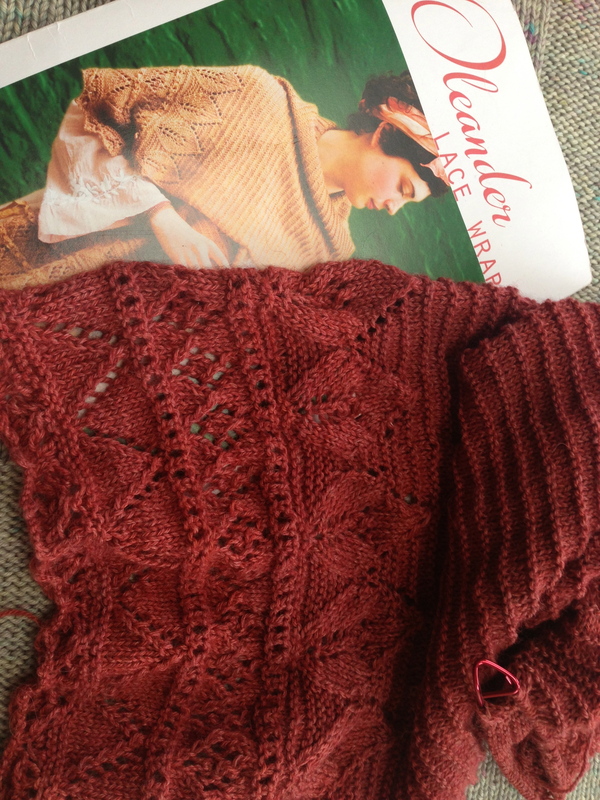 I had been inspired over the summer by a delicate shawl pattern I had spied in Loop. It was way beyond me (I hadn’t progressed to reading patterns that were more than two lines long) but I decided it would be the next challenge. Tony has dubbed it the ‘Frog shawl’ mostly because all he ever seems to see me doing is unravelling it. The pattern is so complex that I am constantly losing my place, making a mistake, and having to unravel the last four or five lines back to a point where I can pick it up again. It feels very much like the story of the frog in the well. After long stretches on the train in France I finally made it past the complex lace pattern at the end and into the simple body of the shawl and it progressed quickly from there. Bad news is that I have to complete two ends of the lace, so I have now cast on the other end and have already had to ‘Tink’ it back twice to pick up mistakes. It’s so complex I can’t do it when I’m tired or doing anything else, so there are only small windows where I make progress. I’m hoping I can make it past the lace this week, because once I’ve achieved that I can work on it while I’m on calls and in meetings at work. I picked up some lovely, bright, hand-dyed Welsh wool the other weekend at the Spitalfields markets and have cast on my first free-form project (no pattern – eep!). It is a simple cowl scarf thing – you know, one of those circle scarves that are all the rage at the moment. Mine will be a single loop (not one of those really long ones that goes around twice) with a twist to give it a bit of interest. It’s a great, simple project to work on while doing other things, and thanks to a long week of meetings and calls has progressed to over a foot and a half ! I frequently knit on calls for work when I’m working from home. It means I concentrate on the call more, instead of getting distracted by emails or surfing the internet. I sometimes take my knitting to the office when I have a long day of calls to sit on, and a couple of people have remarked at how unusual it is. This week I took it one step further and took my knitting into our monthly team meeting. At an hour and a half, the meeting can get a little tiresome. 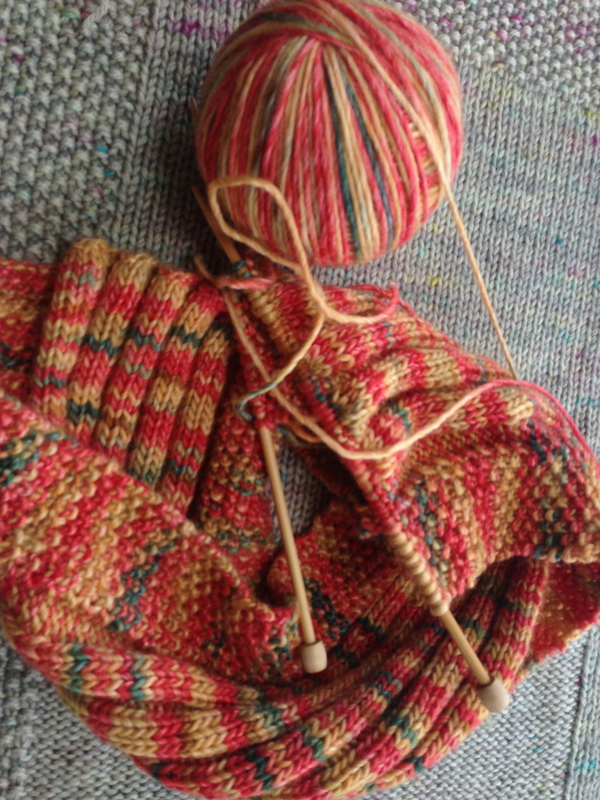 I felt the knitting would help me concentrate – and I can still follow the slides that go with the presentations. I was called out by our team leader when he noticed and everyone laughed (mostly with me). It is so unusual for people to be doing anything other than staring at a screen in meetings I don’t know that they knew what to make of it. Once upon a time you would have expected people to have something doing with their hands – knitting, embroidery, painting, sketching – and for women it was a measure of how accomplished they were. I am determined to keep it up. It increases my productivity, and gives me a sense of calm concentration at the same time. After the meeting many of my team members, including men, came up to me and said how much they loved the fact I’d been brave enough to knit in public, and wished they could knit. I told them that 12 months ago I couldn’t and it’s never too late to learn. Ascot was on shortly after we arrived in London. 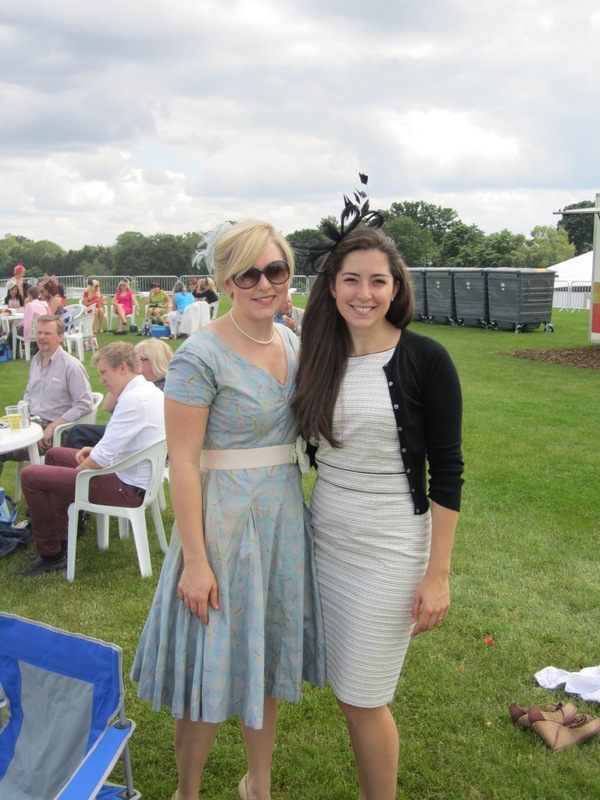 I love planning outfits for the races, the hats particularly, but we had no money when we arrived and not very much time so I had to settle with an existing outfit. I decided to wear the 50s style dress I had worn to a summer wedding just before we left. Because I’d only recently worn the outfit I was hesitant to wear exactly the same combination again – boring. So I put some thought into how to make the outfit a little different and new without spending any money. For the wedding I had matched the outfit with brown shoes and belt. They worked to take the outfit through to the evening as darker colours are less ‘daytime’. For the races however I could add an extra level of whimsy and light. I teamed the dress with a cream belt that had a silk flower on the side, and switched out the brown shoes for cream patent leather stilettos (carefully packing my cream lace flats into my bag). I also swapped grey pearls for white to match the cream shoes and belt. A handbag was necessary (which hadn’t been the case for the wedding), and so I polished up an old orange Prada that actually matched the marigold colour of the cording and the flowers in the dress. If you can’t match your shoes to your bag – then your bag (or shoes) should be a deliberate contrast and work in with the rest of the outfit. Finally I found a £10 fascinator in pale blue as my effort at a hat. I wasn’t happy with it. I have a thing for hats and would have loved to have the time and the money to put together something that really complimented the dress. But it did the job. We had a great day. It was sunny, we saw the Queen, we had a flutter and won enough to keep us happy. The matching cape came to the rescue when the sun disappeared, and my flats came in handy walking for miles from the train station to the race course, back again and then standing on the train for an hour to get back into London. 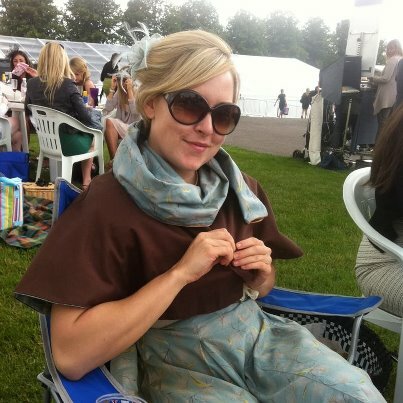 This year however we’ve got tickets to a marquee at Ascot – and I think the full Royal Ascot dress code applies. It is still 5 months away but its time to start planning. 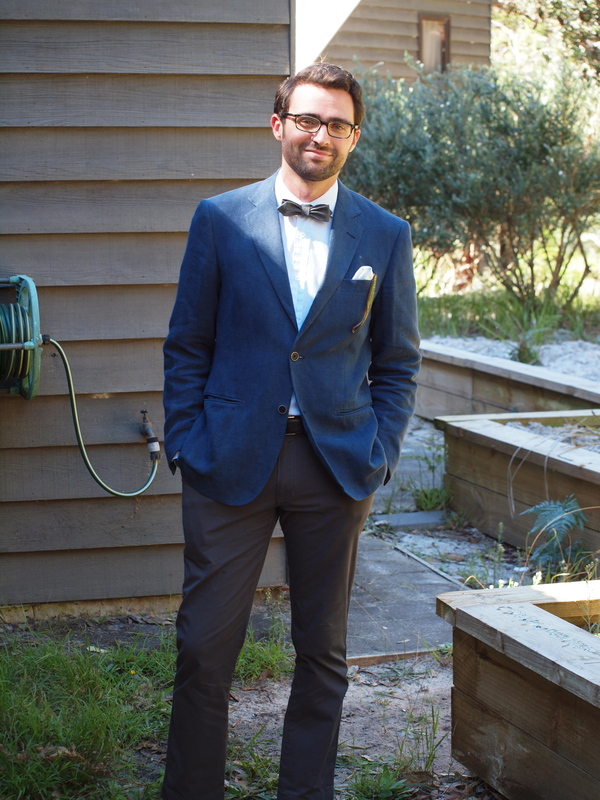 A wedding in the coastal bush land of NSW posed an interesting challenge for outfit planning. We had to contend with the site for the ceremony which was off the beaten track, late afternoon ceremony, and lots of dancing. 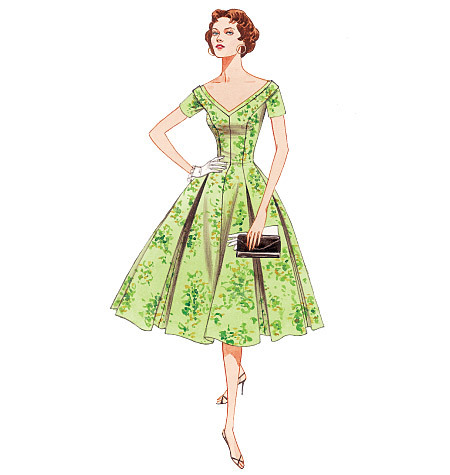 My immediate go to style for weddings is the 1950s and early 60s. The full skirts are a lot of fun to wear, easy to dance in or sit for long periods during speeches and I always feel that they add a certain amount of whimsy to an event. So many cocktail dresses these days have pencil skirts which, while figure flattering (if you have the right figure), are constricting and serious. Having been glued to Mad Men for 5 seasons, Betty Draper’s outfits have provided a lot of inspiration. Vogue and Butterick have helpfully re-vamped their vintage pattern collections, providing me with templates to work with and create some great pieces with a vintage line and modern feel. I have frequently lusted over 50s dresses i have found at vintage fairs and well curated vintage shops, however they generally aren’t in my size, and the ones in good condition cost a fortune. They also look a little like you are dressing up as Betty Draper rather than wearing your own clothes. So I started with this pattern, choosing it from a pile I had ordered from Vogue online (they had a sale – it was dangerous). I wanted a balance of a full skirt, short sleeves (to hide the fact that I really needed to get back to the gym and get toned up), and a fitted bodice and waist. 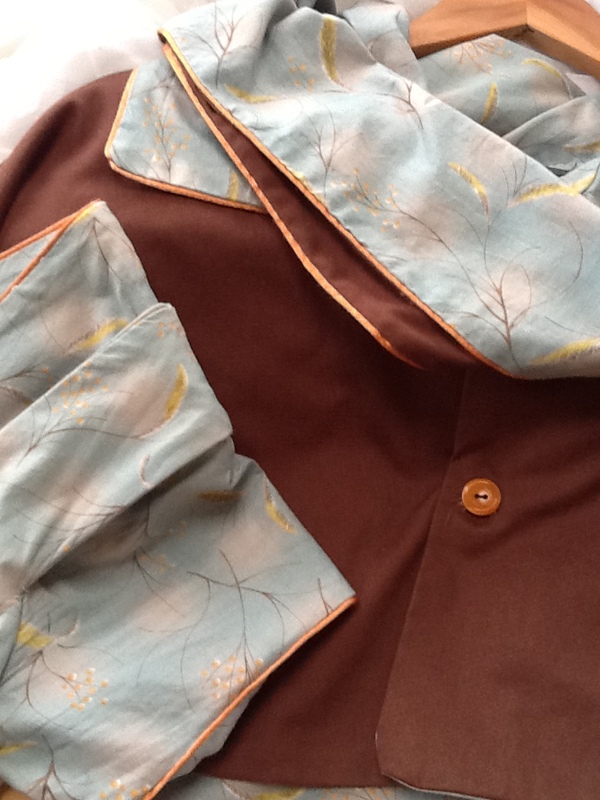 This pattern had an interesting double bodice which presented opportunities for cording in a contrasting colour. 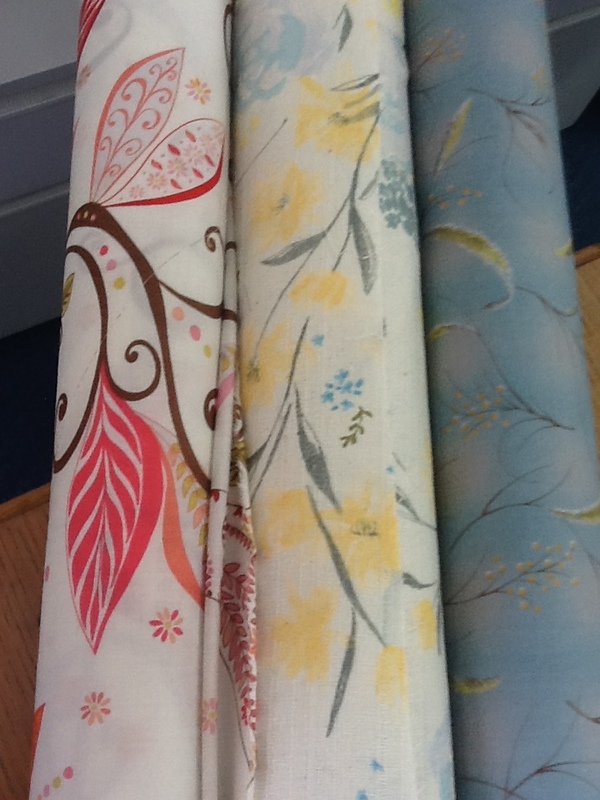 Then, having settled on a pattern, I went in hunt of the fabric. If you have read my thoughts on what to wear to a wedding you will know my thoughts on florals, sparkles and black – so these were out. I also wanted to evoke the outside, bush setting of the event. I wanted to use cotton so that the dress would be light and summery, but cotton is also a hard fabric to translate into evening wear. I didn’t want to look like i’d worn a sun dress to a formal dinner. This meant that the print and colour was going to have to do all the work. I picked out 3 quite different prints, but chose an abstract wattle print on a soft blue background as the colors and leaves evoked the blues and greens of a coastal bush setting and would be the best choice for translating from day to night. I picked a yellow lining in cotton to pick up the wattle flowers in the print. 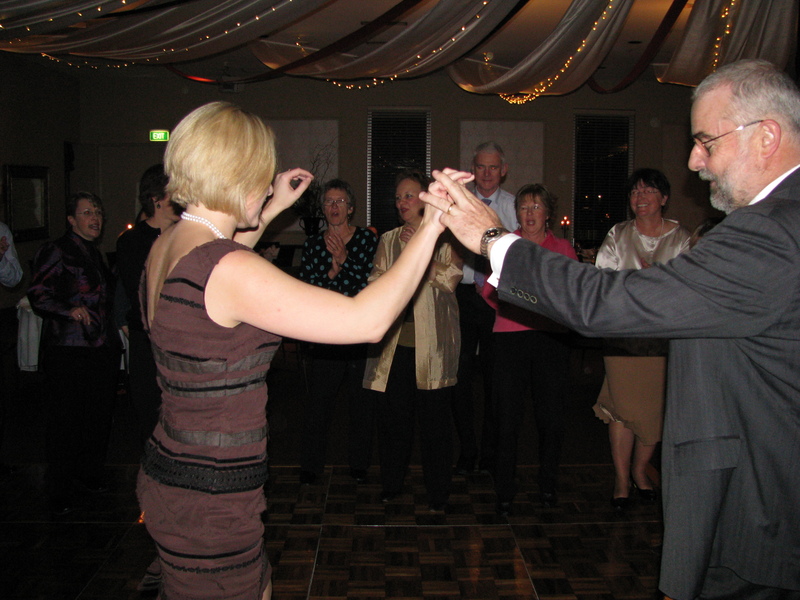 I also had to consider what we would be doing on the day – ie traipsing through the bush to the site for the ceremony, standing outside in the shade in March, and then sitting for dinner in a marquee followed by dancing. This very outdoor event meant that sky-high heels were out, warm layers were needed, and comfort was important. I wanted a warm layer that wasn’t going to look frumpy or be to restricting. I settled on a little cape that had a long collar that wrapped around like a scarf. Having a cape rather than a jacket meant that my arms would be warm without being constricted. The added bonus of the pattern I picked was that it is reversible! I picked up some heavy brown cotton to compliment the brown in the dress fabric, and bought enough of the dress fabric to do one side of the cape as well. The dress pattern was a bit fiddly partly because I was adding the lining to a pattern that didn’t originally have it, and partly because of the double bodice – like fitting a sleeveless dress over a bodice and sleeves and getting it all to sit nicely. I didn’t get it quite right – we were in the middle of moving out of our house in preparation for our move to London and I was trying to get the dress finished around packing and finishing up at work – so the end result wasn’t perfect but it worked. I had bought cording in the same yellow as the flowers in the pattern and used it to define the neckline between the bodices, and to trim the edge of the sleeves. There was also enough to line the edge of the cape. I wanted to team the dress with a yellow belt in the same marigold colour as the cording and the flowers but I ran out of time to find fabric and make one, so in the end I settled on chocolate brown, which went nicely with the cape, and brown peep-toe heels. I had little lace flats for the walk through the bush, and for dancing in later. Another hard and fast rule of mine is NEVER be one of those girls in bare feet because her shoes are hurting. Be prepared – bring some flats. 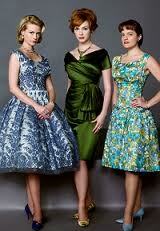 They actually look really sweet with 50’s style skirts. Jewellery was hard – earrings didn’t work with my short haircut at the time, and the neckline was already pretty busy with all the cording and layers so I wanted to keep it simple. I wore some silvery grey pearls – a single strand and matching pearl studs. I usually believe in wearing a hat to a wedding – particularly an outdoor or church wedding – but I simply didn’t have time to source or make one – so I went bareheaded. The world didn’t come to an end. The day of the wedding was perfect – sunny clear sky and a warm breeze meant I didn’t really need the cape until night fell. Tony looked dashing in a Navy blazer, brown trousers and pale blue pocket square that complemented my dress but didn’t ‘match’. The bride looked stunning and the groom was very handsome – as they should. I was told by the caterers that they had voted me the best dressed guest – apparently a vote they have for every event they cater for – I was very touched. 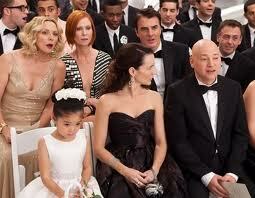 It was an excellent wedding and I felt comfortable and classy the whole night. Well here it goes – I’m starting a blog about what I wear. I am not one of those people who take pictures of their dinner and post them on Facebook. I don’t status update or tweet. I do however love getting dressed every day and put a lot of thought into the process. I believe it is worth the time and effort. I feel great, and the people I work with are generally entertained by my efforts (I think they all believe I have a closet the size of a house – I don’t). The most frequent comments are ‘your clothes always fit you so well’,’you’re always so put together’, and ‘you have a good eye’. Whilst i’m flattered by this I don’t really understand why this should be worthy of comment. Doesn’t everyone think about what they put on in the morning? Why shouldn’t my clothes fit me properly – don’t yours? Apparently not. This suit was the result of some luscious silk houndstooth fabric that my gorgeous friend Lady Lissom had in her shop in Melbourne that was crying out to be made into something special. 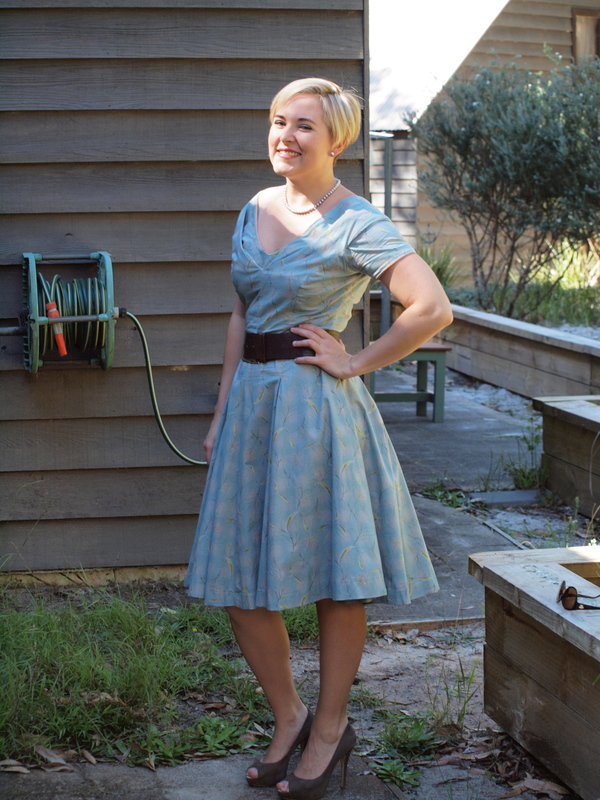 I made a full pleated skirt, added lining to give it weight and to make it silky to wear. The jacket was a ‘thrift’ find at the Camberwell Markets. The biggest challenge was finding a navy jacket in just the right navy to match the blue in the skirt – but I was incredibly lucky to come across this one on my first day hunting. Leftover bits of the skirt fabric became new cuffs for the jacket to add some necessary length in the sleeves and to tie the jacket to the skirt as a proper suit. I replaced the original buttons from the cuffs further down on the new cuffs so that they matched the buttons on the front. The only challenge with wearing it is finding a top to wear with it that doesn’t detract from the clean lines or add too much bulk, and that doesn’t clash with the yellowy cream of the houndstooth. That, and finding navy shoes and handbag to match of course.